Innovation is the lifeblood of the AV business. It’s what makes our industry so exciting: the compulsion to create new things that make people ask, “How did they do that?” It’s the drive to dream up something people didn’t even realize they needed, and deliver something they can’t live without. 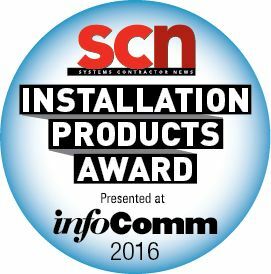 The 2016 SCN/InfoComm Installation Product Awards will showcase the most innovative commercial AV products of 2015. Manufacturers must enter their product or products for consideration before March 25, so please submit your entry now. Please send one high-resolution image of each product entered to SCN Associate Editor Matt Pruznick (mpruznick@nbmedia.com). Winners will be announced during InfoComm 2016 in Las Vegas, NV. To be eligible for an award, the company must be exhibiting at InfoComm, and the product must have shipped in 2015. Each product entry is $295 and must be sent in with the entry form.